Gremlin turned arachnid! Fans of the Gremlins and Gremlins 2: The New Batch movies will want this incredible recreation of the creepy Gremlin that gets turned into an arachnid. 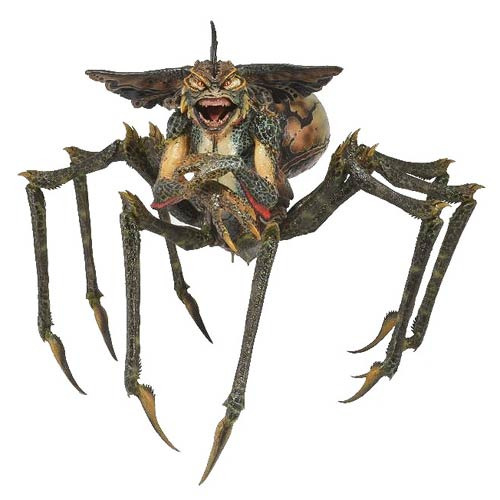 The Gremlins 2 The New Batch Spider Gremlin Action Figure is enormous at nearly 15-inches wide x 12-inches long x 10-inches tall, and absolutely filled with detail. With over 30 points of articulation, this fantastic figure features a hinged jaw; ball-jointed shoulders, elbows, and wrists; and 8 massive spider legs, each articulated in 3 places! Plus, it includes a support stand to help balance and display him in whatever poses you come up with. This will be the centerpiece of your Gremlins action figure collection. Ages 14 and up.